Very possibly the best boys' bedroom ever! In a color scheme of navy, teal, walnut and antique gold, this children's bedroom is both masculine and fun. Newly built walls allow for custom-made American walnut bunk beds that provide each boy with his own private cave. Antique brass wall sconces are tucked inside of each boys bunk so that reading in bed is cool and convenient. Sarah Barnard designed the custom brushed brass ladder and bed rail to complement the antique metal finishes throughout the boys bedroom. Each bunk bed has a pair of blue linen draperies lined with black-out lining. The draperies fit neatly into custom grooves in the bunks so that everything stays just where it belongs. Geometric wallpaper in navy, teal and oatmeal creates graphic appeal in the boys bedroom. The vintage inspired brass and black chandelier makes the room glow with warm diffuse light. Handmade American walnut floating desks paired with small scale marble lamps provide each boy their own study space. 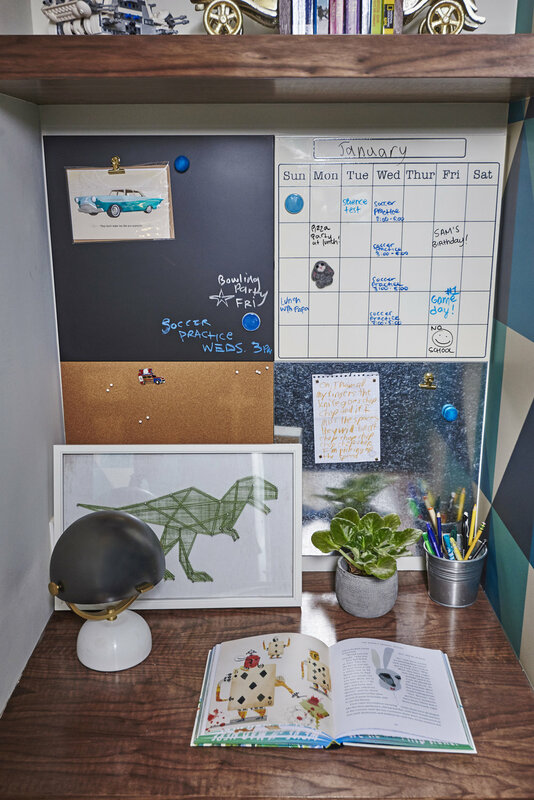 Each boy's desk includes a utility wall with a chalkboard, pin board, metal panel for magnets and wipe off board calendar. Cantilevered desk chairs in antique brass and black leather complete the look. Sarah Barnard is a member of the American Society of Interior Designers (ASID), is certified by the National Kitchen and Bath Association (NKBA), and is recognized by the International Institute for Bau-Biologie & Ecology as a Building Biology Practitioner (BBP) and by the United States Green Building Council as a Leadership in Energy and Environmental Design Accredited Professional (LEED AP). She has served on the Santa Monica Conservancy's board of directors and specializes in sustainable interior design and historic preservation. Undertaking a broad range of projects, all of which are grounded in smart design and mindful of healthy living, Sarah’s diverse body of work includes upscale private residences, chic restaurants, luxurious spas and impressive corporate headquarters. Her projects have been featured in local and national publications, and have placed prominently in several noted design competitions. Sarah holds a Master of Fine Arts degree from Claremont Graduate University as well as undergraduate degrees in Art and Interior Architectural Design. Her interior design practice is the culmination of education and interests in art, architecture, textiles and the environment and she has written several articles for important publications including the USGBC, United States Green Building Council.